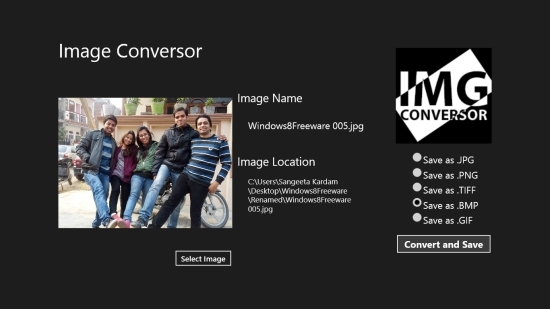 Here are 3 free Windows 8 Image Converter apps. These apps help in converting images from one format to other. They support a large number of common image file formats, including JPG, PNG, BMP, GIF and TIFF. While one of these apps convert images one by one, others support batch image conversion. This speeds up the entire conversion process and saves a lot of time. Here we are going to cover Simple Photo Converter, ImageConversor, and Image-O-Matic. All of these apps are available in the Photo category of Windows Store and can be searched using Win+ Q key combination. Let’s have a detailed look at these apps. Simple Photo Converter (as the name suggests) is a simple and easy to use Windows 8 Image Converter app that lets you convert photos between various image file formats. The app supports JPG, JPEG-XR, BMP, PNG, GIF, TIFF as input image formats, and JPG, BMP, GIF, PNG, TIFF as output formats. Apart from that, this free Windows 8 Image Converter app also supports converting images in a huge number of RAW (Canon) file formats, including Digital Rebel XT, Digital Rebel XTi, EOS 40D, EOS 50D Digital, PowerShot S100, PowerShot S110, PowerShot SX50 HS and many more! 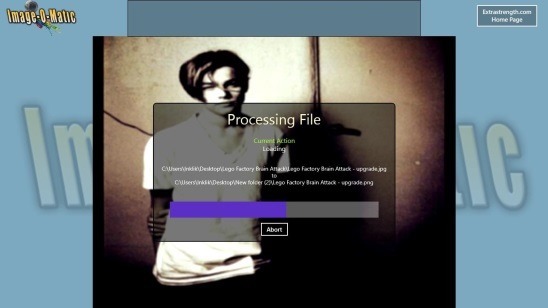 Simple Photo Converter supports single, as well as batch image conversion. While converting the files, you can also rename them side by side. This adds to the usability of the app and makes it a must try. Click here to get Simple Photo Converter. Next is ImageConversor, a handy Image Converter app for Window 8 that allows converting image files from one format to another, one by one. You can select a single image file at a time to convert it to the desired format using this app. ImageConversor supports JPG, BMP, and PNG as input file formats, and JPG, PNG, GIF, BMP, and TIFF as output file formats. Though it can not convert images in bulk, it can still be given a try because of its simplicity and ease of use. Click here to get ImageConversor. Last in the list is Image-O-Matic, which is actually an Image Editor app. This app offers a bunch of useful image processing functions, including image conversion, image resizing, cropping, and other image adjustments. The app supports processing multiple images together, and hence offers batch image conversion. The supported file formats are PNG, JPG, TIFF and BMP. Image-O-Matic is probably the only app in Windows Store that offers so many batch image processing features for free! This app must deserve a try. Click here to get Image-O-Matic. These were some free Windows 8 Image Converter apps. Hope you find them useful. Try them and share your views via comments. Do let us know if your know about some other free Windows 8 Image Converter. 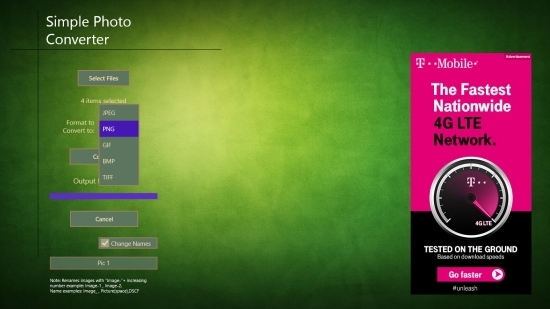 Also try this Windows 8 app to add cool effects to your photos.